(Nanowerk News) An international group of researchers has arranged 2D nanosheets of boron nitride, the “white graphene”, into membranes with a significant level of conductivity and chemical and thermal stability up to 90°C. Achieving an enhanced rate of ion flow through channels and porous membranes is important for a range of applications, such as energy storage and water desalination, but it is challenging. The collaboration of researchers from Deakin University and ANSTO in Australia, the Sorbonne in France and Drexel University in the US, has just published the study in The Journal of the American Chemical Society ("High and Stable Ionic Conductivity in 2D Nanofluidic Ion Channels between Boron Nitride Layers"). Boron nitride nanosheets are usually hydrophilic and the team used an understanding of the nanosheet interactions in solution during a filtration process to allowing nanosheets to self-assemble into the special structure in aqueous solution. ANSTO instrument scientist Chris Garvey and Guang Wang an Australian Institute of Nuclear Science and Engineering Post Graduate Research Award recipient from Deakin University, used small angle X-ray scattering ( SAXS) at the Australian Synchrotron as a structural tool to probe the material and characterise the nanofluidic channels in a dry and fully hydrated boron nitride membrane. “The interaction of the nanoparticles in solution allowed the nanosheets to self-assemble into material with an interesting structure as a thin film with enhanced conductivity,” explained Garvey. “As you remove the water during the manufacturing/filtration process, the particles come closer together and the interactions between the particles become important in the self-assembly process and the final structure,“ said Garvey. The boron nitride nanosheets stacked up in a well-aligned manner and formed a lamellar membrane structure. Thousands of parallel slit shaped ionic channels formed in a particular orientation on the membrane that acted as a nanofluidic conduit. “By contrast to an electron microscope, with SAXS you can look inside a material and see how it is assembled, we can see what happens when you put water and salt in a nanosized compartment,” said Garvey. Measurements at the Australian Synchrotron at the SAXS beamline allowed them to determine the average spacing between the layers. “The X-ray beam, which is about 200-300 microns in diameter, is well suited for analysing a many nanolayers, giving a statistical perspective on structure,“ said Garvey. SAXS measurements perpendicular to the beam indicated a lack of structural order along the lateral direction of the membrane, which had also been reported for nanosheets of graphene oxide. The overall structural perspective suggested the ions were being excluded from the inner spaces of the channels in the membrane. 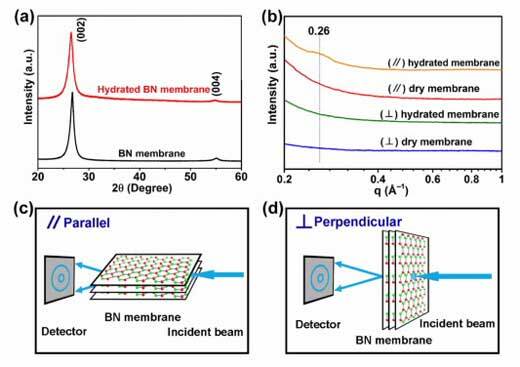 Measurement parallel to the boron nitride membrane allowed them to determine that water molecules and ions remained in the intra-layer channels. The way ions pass through the nanoscale fluidic channels is significantly different from the way ions pass through the bulk. The authors concluded that a negative surface charge at the interface between the channel wall and the electrolyte was found to play an important role in ion transport. Garvey said that the physics of filtration processes were not well understood, with further understanding having relevance for many applications, such as assembly of these materials but also including the way clay soils behave. Boron nitride membranes could be an attractive and promising replacement for current 2D nanomaterials subject to harsh conditions.